Under escalating pressure from residents, advocates, and the media, Mayor John Tory announced this morning that he would address the shelter crisis by adding more shelter beds to the system and making a request to the federal government to open the Moss Park armoury for additional space. Make no mistake, this is a manufactured crisis. To ensure that everyone who needs a bed can access one when they need it, there needs to be flexibility built into the system. The system needs a lot of empty beds that may never be used. But so far, City Council has failed to pony up the money necessary to add that extra capacity to our shelter system. “Every system is built to fix the last system’s problems,” Mark Richardson, an open data advocate, reminded me, as he pointed to the City’s $3-million system that manages shelter data. It’s called the Shelter Management Information System, a David Miller-era creation that came online early in the Rob Ford years. 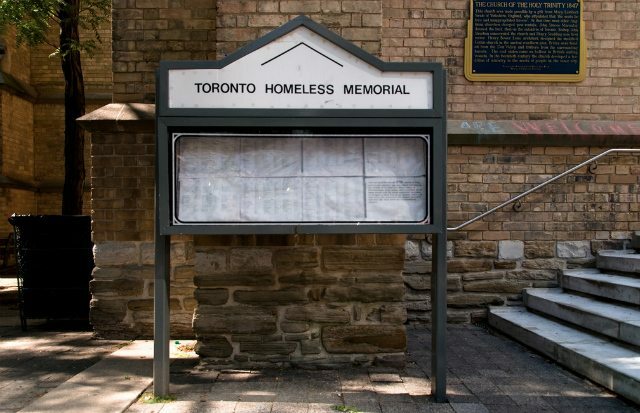 Back in 2004, the Toronto auditor general, Jeff Griffiths, reported that between 2001 and 2003, the City of Toronto paid $853,000 for emergency shelter beds that were never used. In 2013, Council resolved that “actual bed nights as a percentage of capacity in shelter services should never fall below the Council approved rate of 90 per cent.” There has been a persistent lack of confidence in the quality of the data the City publishes on current usage of Toronto’s shelter system, which has muddied the waters around whether the City is living up to its own resolution. The City says shelters aren’t full because the shelter system as a whole still has some spaces left, while users of the shelters, housing activists, advocates, and journalists say shelters are effectively at capacity because a woman who visits a shelter for women and finds it full, for example, can’t exactly go to the men’s shelter on the other side of the city that still has space and claim one of its spare beds. There are several significant issues with the quality of shelter data and the debates raging between Council and activists. (Desmond Cole published a detailed explainer on the issue yesterday.) It is clear that government data is being constructed and used by politicians to essentially hide a crisis and justify underfunding the shelter system. It puts a dollar amount on the lives that have been lost as flexible capacity hasn’t been funded to keep up with the increasing demands for space. As for the data, in addition to the quality issues, it’s not easy to access. In February 2015, Melissa Goldstein, an activist working for Housing Action Now, explained to me the inefficient process researchers must follow to access the information. Data on shelter usage is made available on a daily basis via the City’s website and only shows a high-level summary of the previous day’s data. If you are researching usage of Toronto’s homeless shelters, you have to visit that web page every day and collect one day’s data at a time. And you can only collect current data; it is impossible to go back in time and view data from previous days, months, or years. Goldstein asked if the collection of this data could be automated. Data journalist and friend of the open data community, William Wolfe-Wylie, confirmed that it could be. In a volunteer capacity, he built a web-scraper to automate and publish the data into a publicly-accessible spreadsheet that now makes available two years’ worth of daily shelter statistics. Due to changes to the City’s webpage, the scraper stopped working on October 27 for a short spell, so there is a gap in the data, but it’s back up and running with data as of December 28. Here’s the JSON being produced by the scraper. That sentiment is at the heart of an amendment motion recently put forward by Councillor Paul Ainslie (Ward 43, Scarborough East) to “immediately release, through the City’s open data portal, data collected by the Shelter Management Information System regarding current daily occupancy statistics per shelter including the data collected for each shelter for the past year.” There are two things in his motion: more granular data and a baby step toward being more open with this data, period. For now, this is a small step towards rebuilding trust in the data and the system. This data is an important tool to inform research and policy. This is made clear through the original motion put forward by Councillor Kristyn Wong-Tam (Ward 27, Toronto Centre-Rosedale) in December to improve data collection on the homeless population. Her item and Ainslie’s amendment were both deferred to the January 31-February 2, 2018 Council meeting, or to a special meeting to be called by the Mayor. Data will help if it’s accurate. But data can be weaponized to suit narratives. As we’ve seen, this is government data that has essentially been used to hide a crisis. Open-washing and using data to support political communications is a very real issue within the open data space. As an open data user, if you can’t talk to someone that represents a data point in the data set or someone that is highly knowledgeable on the issue, you shouldn’t use the data. Goldstein warned of this back in 2015, saying that this data is helpful to researchers that know the issues on the ground, but that the data itself was problematic. Case in point: the shelter occupancy data produced by SMIS alone does not give an accurate picture of the manufactured crisis in this city—only talking to shelter users, front-line workers, and City staff can do that. It’s an issue the civic tech community is aware of and needs to continue talking about and thinking on. The team at Geothink, a Canadian geospatial and open data research partnership, is holding a free online education session on the data of social justice on January 26 to support this kind of learning. And as open data expert Tracey Lauriault of Carleton University has been persistent about in many cases, open data demands open methodology and accessible explanations of how data is created. “The recommendations [of the 2004 report] echo the view of housing advocates who say too little time and money is spent on finding long-term accommodation for those in need.” Fourteen years later, the message is still the same. Fund housing now.